The appointment of Dr. David Sylvester as 8th President and Vice-Chancellor of the University of St. Michael’s College was made by The Very Rev. George Terence Smith, C.S.B., Superior General of the Basilian Congregation upon the recommendation by the Collegium at a Special Meeting held on February 15, 2018. Dr. Sylvester’s term was effective July 1, 2018. Dr. Sylvester comes to USMC as one of Canada’s most experienced leaders in Catholic higher education. Since 2009, he served as the Principal of King’s University College at Western University, having been renewed for a second term in 2014. Before coming to King’s, Dr. Sylvester served for a decade as the founding President of Corpus Christi College and as the Principal of St. Mark’s College at the University of British Columbia. Across these institutions, Dr. Sylvester has been praised for his strong commitment to answering the needs of students, fulfilling the Catholic mission of the institution, ensuring it has the financial and operational capacities required to succeed, and leading through example and through consensus-building and collaboration with faculty, staff, students, alumni, and members of the broader community. Upon his arrival at King’s, Dr. Sylvester led a record-breaking $15-million-dollar fundraising effort in support of new buildings, programs, and student aid; expanded and enhanced academic programming through ambitious hiring and new, dynamic local and international partnerships; and reinvigorated the university’s relationships with its alumni and community supporters. A social economic historian, Dr. Sylvester’s area of research focuses on the nature of community in the middle ages, with a particular interest in how the culture of medieval port towns was shaped by environment related to the activities of shipping, trade, fishing, and piracy. He holds an M.A. and a Ph.D. in medieval history from Fordham University, New York City, has taught in the departments of history at the University of British Columbia, Corpus Christi College, and Fordham University, and has been a tenured associate professor in the department of history at King’s since 2009. He continues to publish on the medieval English urban confederacy known as the Cinque Ports and is a member of the Medieval Academy of America, among other professional associations. 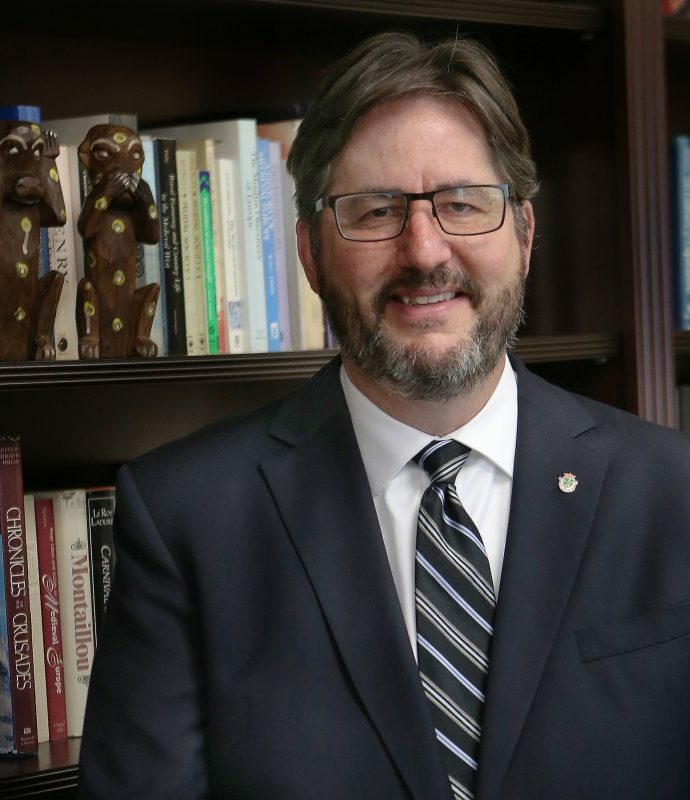 He is the current Chair of the Governance Committee of Universities Canada and a member of the Boards of the Canadian Federation for the Humanities and Social Sciences and the Boston College Institute for Administrators in Catholic Higher Education. He is the past Chair of the Association of Catholic Colleges and Universities of Canada (ACCUC) and since 2012 he has been the Canadian elected representative to the Board of the two-hundred- member Association of Catholic Colleges and Universities based in Washington, D.C.
Dr. Sylvester and his wife Dr. Allyson Larkin, Associate Professor of Social Justice and Peace Studies at King’s, are parents to four children.